Buy it in full colour! | Buy it in greyscale! Yahoo, it's our third book! It's December 2017 and Tails of Lanschilandia returns with a third print anthology for you to buy, keep and brag about! As the other books, it's printed by Lulu and available in full colour or greyscale (much less expensive!). 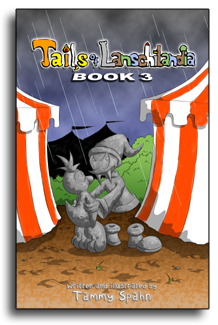 Follow the continued exploits of Lanschi the duck and his friends as they try to foil the plans of the evil wizard Kakralomino in this good ol' print comic book. Fun and wonderfully weird wackiness for all ages! Click one of the links to the left to be taken to the product page on Lulu, or check out the feature list and FAQ below first to get a detailed look at what's in this one! ...totalling 78 pages of pure comic fun! Support a potentially starving indie author (that's I) with your purchase! None of these questions have actually been asked yet. I'm asking them myself so you don't have to! Why is the full colour version so twiddling expensive? You're so greedy! The books are printed "on demand" by Lulu - that means when you order one, you're getting a high-quality print copy created specifically for you. This unfortunately makes the books expensive to manufacture; only a miniscule amount of each sale is going into my own pocket. The less expensive (per individual book) "bulk printing" procedure is not an option at this time as there's not enough demand for the books. Sorry! What happened to Dyllis Filler? There are no Dyllis Filler pages in this print edition - sorry about that! With 78 Tails of Lanschilandia pages already featured, they've been excluded to prevent making full-colour prints even more expensive with pages that are neither from the main comic nor in full colour. If there's demand (and it keeps running for long enough), Dyllis Filler may eventually be printed in its entirety in a dedicated black-and-white volume. What resolution will the pages be printed at? All pages will be printed at 300 DPI, a significantly higher resolution than their online ("web resolution") counterparts and closer to the size they're created at before being shrunken for the web. That means they should look a lot better! Pretty much. What you see on the website is what you get. Is the introduction page included, like in the first book? Nope - this book reuses the two-page overview of the main characters from Book 2, showing their names and faces. What's up with those other books by Tammy Spahn on Lulu? For information on my Fantasy books, please see the Pelsatia website!